All Pro Acme glasses frame provide superior clarity with optically-correct lens performance; whether it is through Polycarbonate lenses or Crystal lenses, the world has never looked better or clearer. •Pro Acme is one of the leading designing and sales companies of eyewear. By innovation and creation, we own advanced producing technology and quality control methods, specializing in producing Sunglasses, Sports Eyewear, and Optical Frames. •Pro Acme offers trendy, up to date latest eyewear styles with qualities and designs surpassing similar mainstream product. •Pro Acme Glasses Official Store Provide the Good Quality Glasses and Customer Service on Amazon. Please be aware that colors might look slightly different in person due to camera quality and monitor settings. To clean your sunglasses, use water and soap avoiding all types of solvents or alcohol. Do not use dirty or abrasive cloths which could alter the features of their filters. Use only original accessories and spare parts. Keep in the cloth or hard case in a dry place at a temperature between -10 Degrees Celsius and +35 Degrees Celsius. 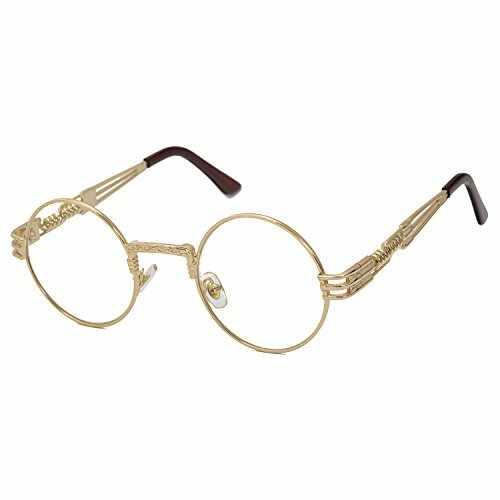 IDEAL FASHION ACCESSORY - Groovy John Lennon style makes you more attractive and eye-catching in outdoor activities enthusiasts or in the party, and enjoy the gushing compliments when wearing these celebrity clear lens glasses. PREMIUM MATERIAL - The temple is made of metal with reinforced "Flex Fit" metal hinges and Clear lens. You can wear it for fashion. Of course, you can also replace them with your own prescription lenses at the local optical eyewear store. PREMIUM PACKAGE - Comes with Brand Gift Box, Authentic Pro Acme Microfiber Pouch, Microfiber Cleaning Cloth, User Manual and Tag. 30 DAYS MONEY BACK GUARANTEE - 100% Satisfaction Guaranteed. Please just let us know if you're not happy with your purchase within 30 days, and we'll take care of you. You have no risk to try. If you have any questions about this product by Pro Acme, contact us by completing and submitting the form below. If you are looking for a specif part number, please include it with your message.